Reference the 2015 NFPA 2001 for more economical and environmentally friendly fire protection using clean agent systems. 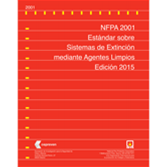 Expanded with new coverage about environmental safety and new types of systems in use today the Spanish edition of NFPA 2001: Standard on Clean Agent Extinguishing Systems provides essential requirements on how to properly purchase, design, install, test, inspect, approve, operate, and maintain engineered or pre-engineered gaseous agent fire suppression systems so they will function as intended when needed. NFPA 2001 now permits the use of recycled agent and sets quality standards, so installers and system owners can recharge systems more economically while reducing emission to limit environmental risks. This new coverage also gives the Authority Having Jurisdiction (AHJ) a clear set of guidelines for system approval. First-time coverage on how to dispose of recovered agent and reduce or eliminate non-fire-related emissions of the halocarbon agents offers greater environmental protection. Added support data and fitting requirements for 200-bar and 300-bar IG-01 (nitrogen) systems makes it easier to use new types of systems. Building owners, installers, maintainers, manufacturers, and AHJs will get a clearer picture on clean agent systems.